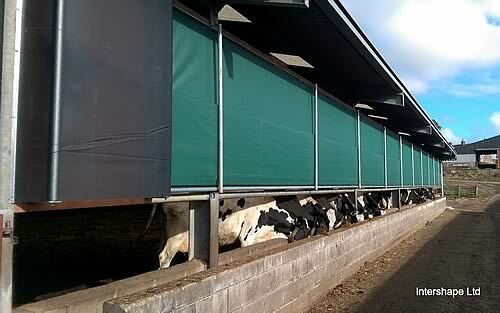 Blythbridge Holsteins in West Linton has just become the first farm in the UK to install Airkoe folding curtains in their dairy barns. The Laird family milk their 500 pedigree Holsteins three times a day and their breeding programme makes them successful in show rings across Great Britain. Alister Laird explains “Our buildings were designed for cows living out in the summer, but with the cows in all year round, we needed to improve the summer ventilation without reducing the protection in the winter. Airkoe curtains are designed by two Dutch dairy farmers who used their practical experience and engineering expertise to create a system which optimises light and ventilation, while offering full protection from the weather. They are custom-made by Intershape to fit each individual barn, CE certified for safety and driven by a single 380 volt drive which can control up to 100m of canvas.